Talk about an unlikely sequel. Shenmue, once the most expensive videogame ever made, died a quiet death as Sega halted production of the Dreamcast. But so beloved was Yu Suzuki’s idiosyncratic, melancholy martial arts series that, thanks to years of campaigning from fans and over $7,000,000 of crowdfunding money, the story of Ryo Hazuki is finally to resume. Shenmue 3 continues the series’ distinctive mix of life simulation, amateur detecting, fighting-game combat and atmospheric world building. Thanks to the almost two decades of advancements in technology and design that have occurred while Hazuki has been staring into mirrors on the sidelines, his return will also feature deeper systems rooted in roleplaying games, and a fascinating new dialogue system that promises to make character interaction more sophisticated. Once again, our sullen teenage martial artist is searching for Lan Di, the man who brutally murdered his father in front of him. His journey has taken him from his quiet hometown of Yokosuka, Japan to the mountains of Guilin, China. But while his quest for vengeance has typically been a lonely one, in Shenmue III he’s joined by a mysterious woman named Shenhua. Her presence is felt throughout the first two games, and he seems to share some kind of enigmatic spiritual connection with her—something that’s lightly touched on in Shenmue II, but will be explored far more deeply in the third game. “In the real world 18 years have passed, but in Shenmue III the story picks up immediately after the events of the previous game,” says Yu Suzuki, creator of the Shenmue series and the writer/director of Shenmue III. “Ryo and Shenhua have arrived at her home village of Bailu, where they once again begin searching for clues to the identity and whereabouts of Lan Di, the person who killed Isao, Ryo’s father. Locals who once knew Isao appear and secrets of the village are gradually revealed as the story progresses. I feel the story is equally enjoyable for both fans of the series and newcomers alike. A far cry from the snowy suburbs of Yokosuka or the chaotic, bustling streets of Hong Kong, Bailu is a sleepy rural village nestled deep in the mountains of Guilin. This is where Shenmue III begins, as Hazuki looks for clues to Lan Di’s whereabouts. And true to the original games, the people who inhabit the village have routines, homes and unique personalities. Learning the habits of the people around you was a big part of what made the first Shenmue so special, and while some of that was lost in the shift to a large city in the sequel, Bailu is a return to the more close-knit, parochial feel of Yokosuka. Shenmue is known for its remarkable attention to detail, especially with regards to recreating the 1980s time period. And the same level of research has gone into creating the setting for Shenmue III. “I once again thoroughly went through all the materials I’d gathered 20 years ago, researched China in the 1980s, indigenous Chinese tribes, their customs, villages and the like,” Suzuki tells us. “I also visited Fujian Province, and did some direct hands-on research on the local people there and their lifestyles.” Suzuki studied photographs of Chinese people in the 1980s to make sure the faces and fashion sense of the game’s many individual NPCs feel authentic to the period. Suzuki has described Shenmue III as “looking inward rather than outward”, which suggests we may learn a little more about Hazuki, the stoic teen who seems permanently oblivious to how much danger he’s in, and how much people care for him. His quest for revenge is, by any measure, incredibly foolish - something several characters have told him throughout the series. But hopefully we’ll delve a little deeper into his character here, even if he will, by Suzuki’s admission, at least start out as the man we know and love. “Since only a month or two has passed since Shenmue II, there haven’t been any drastic changes to Ryo’s character,” he explains. “But visiting this foreign country and interacting with the villagers of Bailu will contribute to his growth. With his pathos and distinctive personality, good old Ryo, the most oblivious man in the world, is still the same as ever.” And fans will be glad to know that the source of much of Hazuki’s charming obliviousness, the voice actor Corey Marshall, will once again play him in the English dub. Marshall has become something of an ambassador for Shenmue, and his enthusiasm for the series and its dedicated fans is infectious – even if that doesn’t quite come across in Hazuki’s languid delivery. But we wouldn’t have the character sounding any other way. As he enters the village, Hazuki sees a group of children practicing tai chi, copying the moves of their master. He approaches the master, a man named Su Zixiong, and begins asking questions. But, illustrating one of the most intriguing new features in Shenmue III, he’s unwilling to talk. Cold, even. Hazuki is trying to locate someone called Mr Yuan, but the master, Su Zixiong, is reticent to reveal anything. “Do I look like I’d know about that?” he says, gruffly. This is what Ys Net is calling the Affinity system, which will require you to get to know people, or make a name for yourself, to reveal key information. It’s a system that plays neatly into the fiction: Hazuki is a stranger in Bailu, after all, and an isolated village like this would likely be wary of outsiders. But the more time you spend in the village, and the more tasks you complete there, the warmer people will become. And if you talk to Su Zixiong with Shenhua in tow, he’ll be much more open and friendly, realising that you know each other. In Shenmue I and II, people would gladly reveal their life story without needing much encouragement, but here you’ll have to get to know someone before they tell you anything about themselves. It’s an intriguing and innovative approach to NPC interaction, making the information-gathering side of the game – which will, once again, play an important role – a good deal richer. The Affinity system will also extend to your ongoing relationship with Shenhua, which will develop as you spend time with her. “The more you speak with Shenhua, the closer your relationship grows, and the more her attitude and expressions change,” Suzuki tells us. “I hope to be able to express the small, subtle changes in everyday life and interactions.” Over the course of the game, Shenhua will become friendlier and closer to Hazuki. 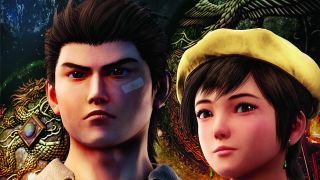 As has been suggested several times in the series, the destiny they share is an important part of the storyline, and this will loom large in Shenmue III’s plot. Arcade games make a return, including this fan favourite, the maddeningly difficult QTE Title. It’s not all destiny and magic mirrors, though. Playing minigames and working menial jobs to earn money has always been part of Shenmue’s peculiar magic, and Shenmue III is no different. Hazuki will start with only a small amount of yuan, meaning he’ll have to find ways to earn his keep in Guilin. In Bailu he meets Liu Fang, a shady-looking villager running a Lucky Hit stand – a ball-dropping gambling minigame with which fans of Shenmue II will be more than familiar. You can try and win some yuan here or, if the second game is anything to go by, it’s possible Hazuki can man the stand himself, tempting passers-by to play a game. The specifics of what jobs you can apply for have yet to be revealed, and Suzuki’s in no mood to elaborate. Needless to say our fingers are crossed for forklifts. Fighting has always been another big part of Shenmue, and this time the combat system is bolstered by an RPG-inspired progression system. “A new battle engine has been created especially for Shenmue III,” says Suzuki. “It’s been designed so the player can repeatedly undergo training to increase their level, to become able to take down even super-tough opponents.” And it seems this will be a lot deeper and more satisfying than standing in the Hazuki dojo, or a Dobuita parking lot, practising the same leg move over and over again. Early in the game, Ryo is looking for a man with a scar on his face, named Xuan Shancun. He finds him running another gambling stand – this one involves throwing balls into coloured buckets to win prizes – and confronts him. The camera zooms in on his scar to make it clear this is the guy you’re looking for, but he refuses to hand over the information Ryo needs – the Affinity system making its presence felt once again. This time the outcome is a lot more violent. Xuan challenges Ryo to a duel, and a fight sequence begins. The combat in the original Shenmue games was rooted in another of Yu Suzuki’s great Sega series, Virtua Fighter. Here it’s much smoother, with cleaner transitions between moves, but that recognisable animation style is still very much present. Unfortunately for Hazuki, however, Xuan is a much better fighter. Yet despite his unsavoury appearance, he’s also strangely sportsmanlike. He tells Hazuki to find a place called Martial Hall, where he can hone his combat skills, and then come back for another round. Training was always important in Shenmue, but how exactly you were improving was quite opaque. This time progression is much clearer, and a more intrinsic part of the experience. "You can also, for the first time, customise Hazuki’s appearance, changing out of his leather jacket and into more appropriate training gear." Two main stats govern Hazuki’s combat ability: Attack Power and Endurance. The latter is tied to a stamina bar on the HUD, which is affected by pretty much everything you do, from sprinting while exploring to performing moves in a fight. Stamina can be restored by eating food, which can be stockpiled in your inventory, and eating before doing something strenuous will become part of your routine in Shenmue III. Attack Power is self-explanatory, dictating how hard you hit. And both of these stats can be improved by visiting the Martial Hall and taking part in a variety of training minigames. You can also, for the first time, customise Hazuki’s appearance, changing out of his leather jacket and into more appropriate training gear. Training is all about timing, reactions, and dexterity. In the Horse Stance minigame, Hazuki strikes an uncomfortable-looking pose and must hold still by rhythmically tapping a button to keep him in line with a HUD marker. Fail to keep him even and he’ll fall over, but hold fast and your Endurance stat will increase, boosting your total stamina. Both Attack power and Endurance contribute to a third stat, Kung Fu, which lets you learn more advanced moves. Another training minigame is the One-Inch Punch, which Hazuki practices on a wooden training dummy. This is another timing-based minigame, based on the famous move popularised by Bruce Lee, and will increase both Endurance and Attack Power. There’s a satisfying, kinetic feel to these training games, particularly the echoing crack of the wood as Ryo strikes the dummy. As your stats increase, tasks become much more difficult in turn. You can also train individual moves using technique scrolls, a returning feature from the first two games. All the scrolls from Shenmue I and II are available to learn, but there are some new ones too, amounting to around 100. Scrolls can be purchased from shops, traded with other characters or found while exploring the world, and the more versatile Hazuki’s moveset is, the easier combat will be in the long run – especially when facing people who use exotic martial arts styles he hasn’t encountered before. Inside the Martial Hall, Hazuki meets a master called Huang Hu, who reveals that Xuan was one of his students. Apparently Xuan was a promising apprentice who travelled from far away to study in Bailu, but his passion left him and he started running gambling stands instead. One of the great strengths of the first Shenmue was how every citizen of Yokosuka had a complex, often sad backstory, as well as relationships with other characters, and it’s promising to see intricate world-building like this making its way into Shenmue III. In the dojo you can spar, challenge other students to a battle and train technique-scroll moves. Ryo decides to spar with a student called Red Tiger, and during the fight the combinations for the moves he currently has equipped appear, letting you practise them in a semi-real fight situation. Timing your attacks correctly and blocking Red Tiger’s moves will slowly increase your Endurance and Attack Power, and ultimately your Kung Fu. Sparring is a much more efficient, and quicker, way to boost your stats, but battling a real person is trickier than hammering away at a training dummy. There are more thrilling, and dangerous, ways to train your combat skills. In Niaowu, a more built-up, urbanised settlement than Bailu, Ryo slips down a trash-strewn alleyway, past a golden statue of a fierce-looking Chinese deity, and sees a buzzing neon sign welcoming him to the Rose Garden. This is a slightly misleading name for a fighting ring located in the courtyard of an ornate temple. Here you can test your mettle against a number of increasingly skilled opponents who, unlike those training dummies, fight back. After paying an entry fee of 1,000 yuan, a mustachioed ringmaster announces Hazuki’s opponent: a severe-looking Muay Thai expert whose nickname is, ominously, The Knee Of Death. Although, in this instance, Hazuki’s martial arts have been trained to the point where he takes him down with ease, the more people you defeat, the tougher your opponents become. And they also use a variety of different fighting styles that can only be effectively countered by mastering certain moves. For defeating the Knee Of Death, whose nickname loses its magic a little when he’s lying there in a bruised heap, Hazuki receives 2,500 yuan, making this an especially lucrative side activity. Other notable Rose Garden opponents include Chris Bellinger, the so-called ‘Mach Fist’, who the ringmaster dramatically claims has “sent countless fighters to surgery with his boxing-tempered fists of steel.” And, at a certain level, Ryo will have to fight multiple opponents at once. For players looking to dive into, and master, the intricacies of Shenmue III’s combat system, this will be a popular way to pass the time. Anyone who battled through the second game’s tough Kowloon street fights will feel right at home, although the Rose Garden is, for those who prefer to avoid combat, entirely optional. As for Shenmue’s, erm, ‘unique’ controls, Suzuki is keen to retain the feel of the original games, but with some degree of modernisation. “It basically carries over the control scheme from Shenmue II, but analogue-stick camera operation, as often seen in modern games, is supported,” he says. “Also, the inventory can now be used in a variety of ways, so we have a new interface. But we haven’t looked to other titles for reference.” Ryo’s inventory is something you’ll delve into regularly, buying and selling items, and picking up hidden objects that can be located by looking around the world using the firstperson camera. And, yes, collectible capsule toys are making a comeback. Will Shenmue 3 make our list of the best open world games to play right now?